As we peered into the woodland by the side of the road we suddenly spotted her. Our first ever Grizzly Bear, digging around in the dirt looking for food, seemingly oblivious to our presence. 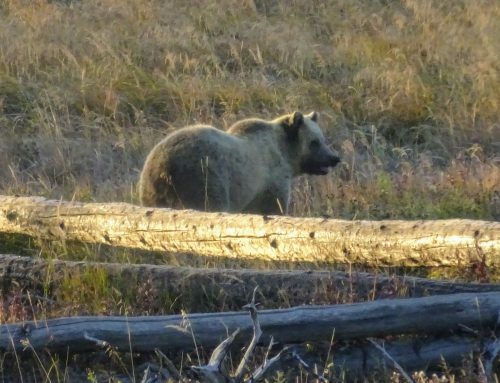 She was huge but not as huge as the male Grizzly that was just about to appear. Yellowstone National Park had been on our bucket list for years and it always seemed like it was to difficult to get to, or the wrong time of year etc. But in the Autumn of 2018, we committed ourselves to visit this amazing, beautiful and awe-inspiring destination. 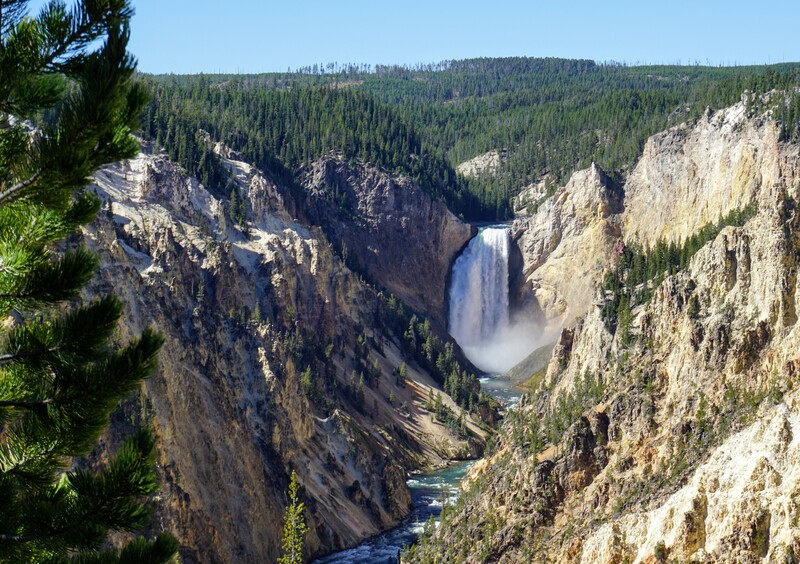 Welcome to Our Family Guide To Yellowstone National Park. 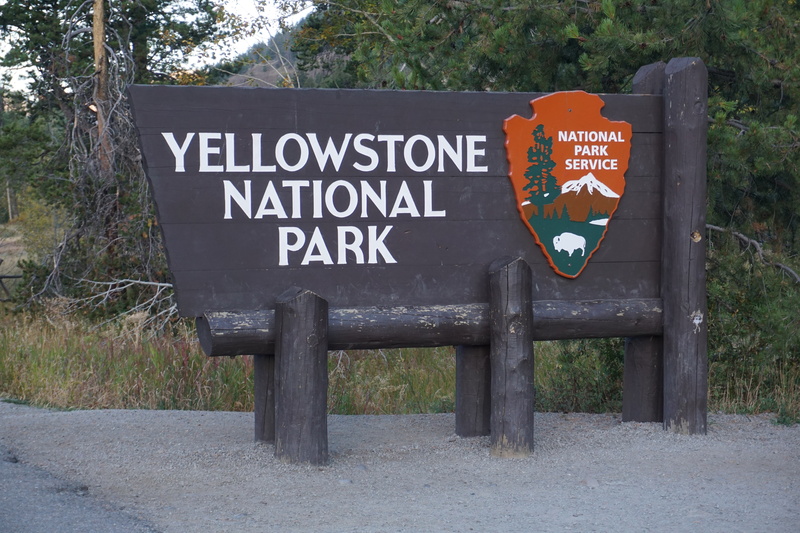 One of the reasons we hadn’t visited Yellowstone National Park earlier was because of its position and difficulty of booking lodging etc. The majority of the park is situated in Wyoming but stretches into Montana and Idaho. It’s not near any major cities so it takes a bit of planning to get there. We flew into Seattle and rented a car from there for our ten-day road trip but Yellowstone is a good twelve hours drive from Seattle. You could also fly into Bozeman or Jackson to be closer to the park. 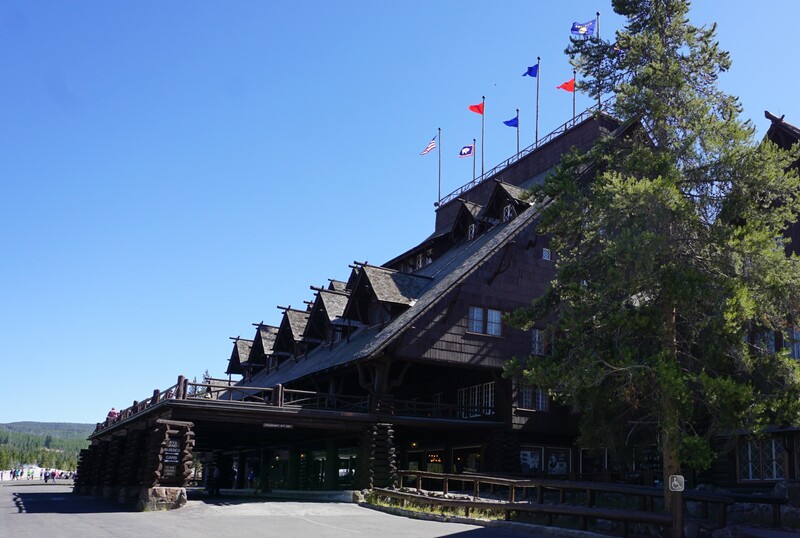 Another big consideration is where to stay when visiting Yellowstone. You can stay in the park lodging but that gets booked up over a year in advance. So the best bet is to stay outside the park but depending on when you visit this choice could be full too. You can see why it takes planning now, can’t you? 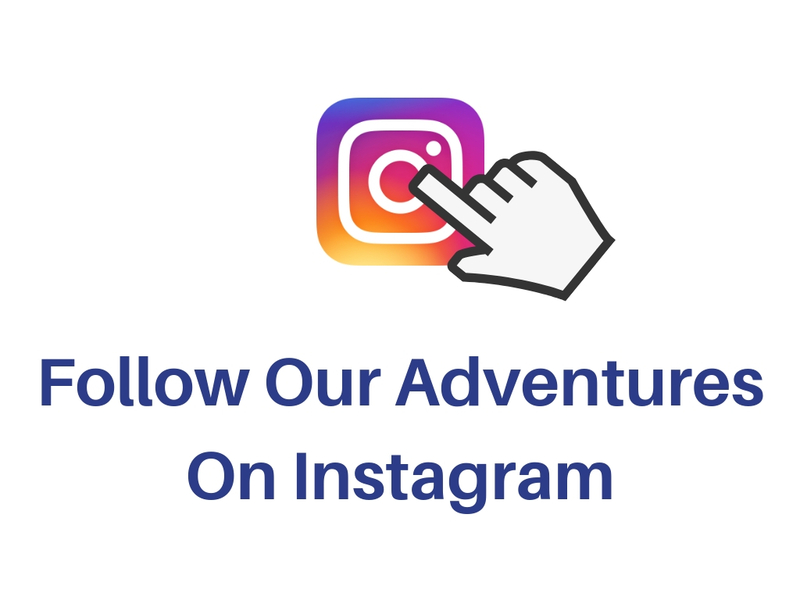 Having said that we decided to visit without any planning or pre-booked accommodation and I’ll tell you our tips on how to do that, towards the end of this article. 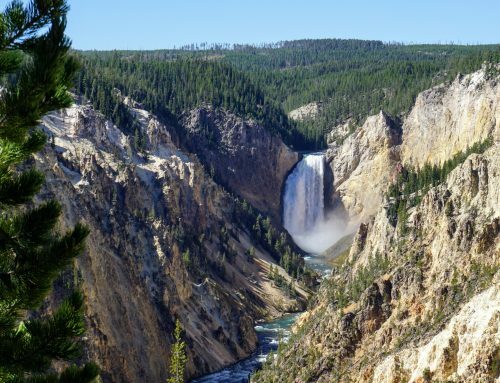 Yellowstone covers a huge area and there is lots to do there. Now you need to know that we pack a lot into our time so our two and a half days there were jam-packed, so if you know you like to take your time then give yourself plenty. We were literally into the park at dawn and out at dusk to make the most of our time. In our opinion, the following are the must-do highlights. 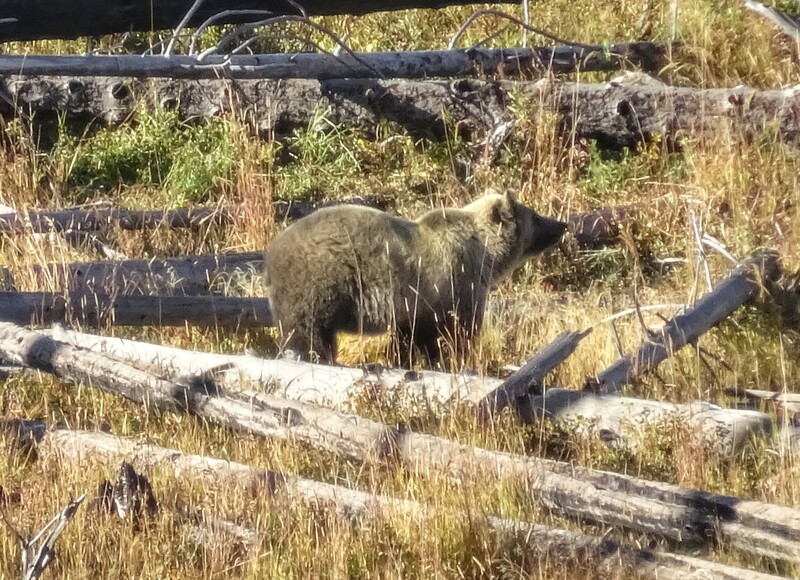 For us visiting the park was all about the wildlife and within 30 mins of entering the park, we saw our first grizzly bear. We were blown away that we’d been this lucky so early on in our visit but it got even better over the next couple of days. The amount of wildlife in the park is astonishing, and we mean astonishing!! 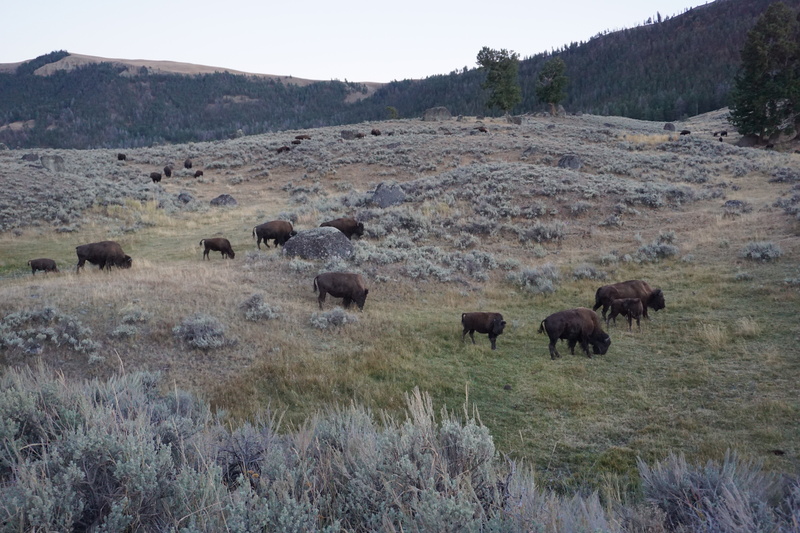 We’d never seen a Bison up close and personal before visiting the park but that changed pretty quickly. It was like being in the most amazing wildlife TV programme ever and all visible either from the seat of our car or a short walk away. 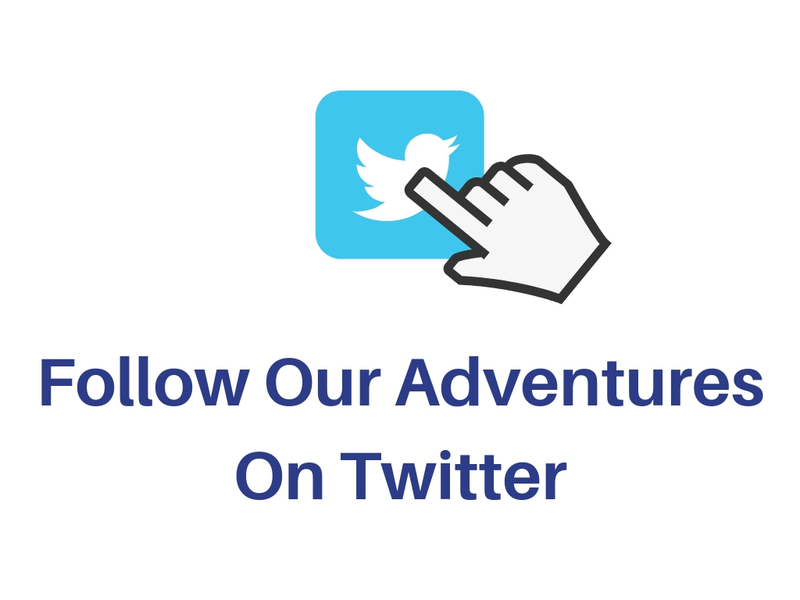 For us spotting wildlife was really exciting so we’ve written about our animal encounters here to give you a better idea of what it’s like. If you like to watch wildlife then we have some top tips to give you more chances of seeing some. Yellowstone National Park contains 60% of the world’s geysers and you’ll find over 150 of them in the Upper Geyser Basin. 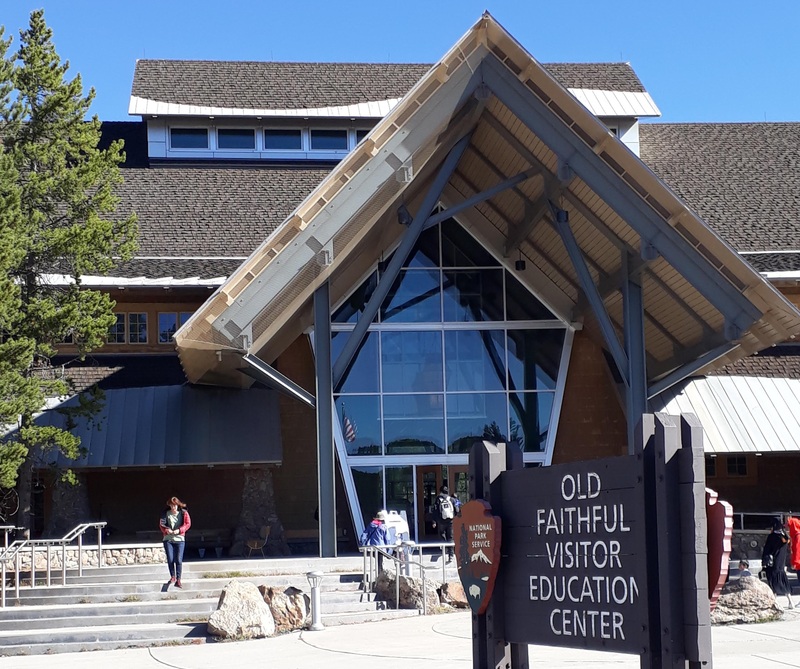 This area not only includes the geysers but also the Old Faithful Inn and the Old Faithful Visitor Education Centre. This is the best place to really get an understanding of the energy and power that Yellowstone National Park holds. Did you know that Yellowstone is a super volcano? You may think that you’re just in a pretty park but you’re actually inside a huge volcanic crater that is like one big cauldron of energy. 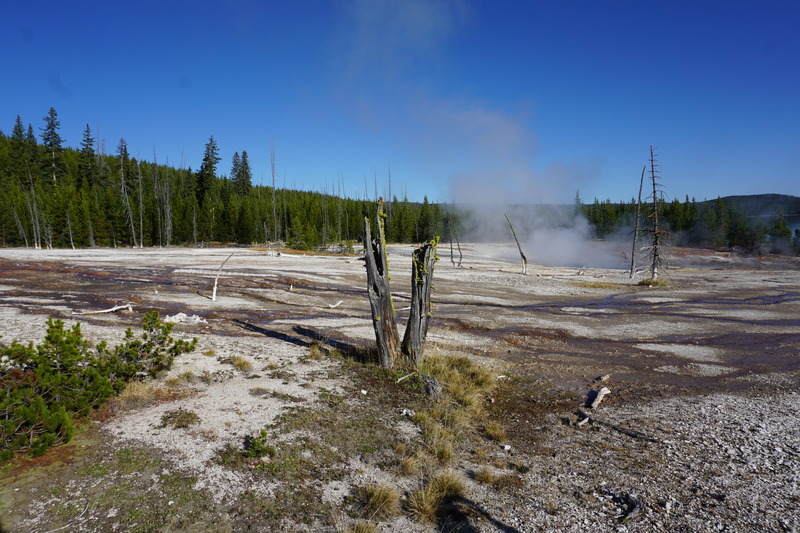 The centre also has the estimated times for any known geyser eruptions as well as expert advice on what to do in the park. 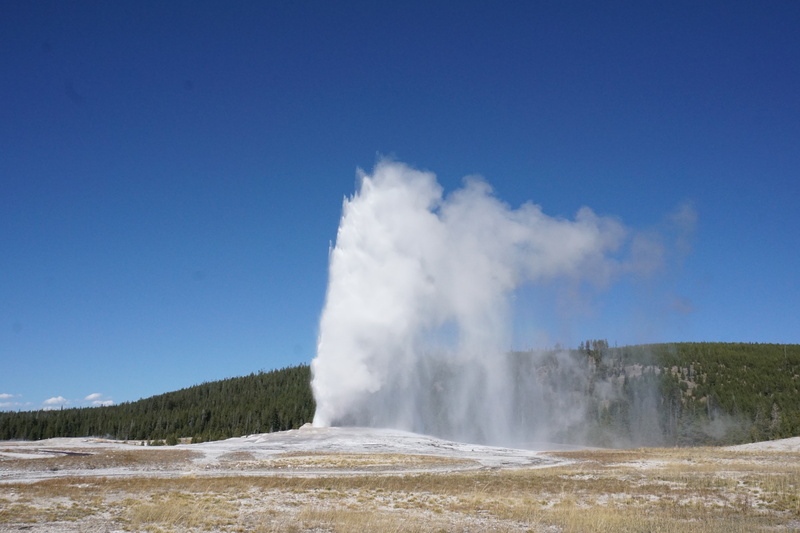 So we’ve probably all heard of the Old Faithful Geyser, right? But we never knew just how many geysers are in the area, 150 in the Upper Basin alone. They are spread of a square mile with pathways and wooden boardwalks connecting them. 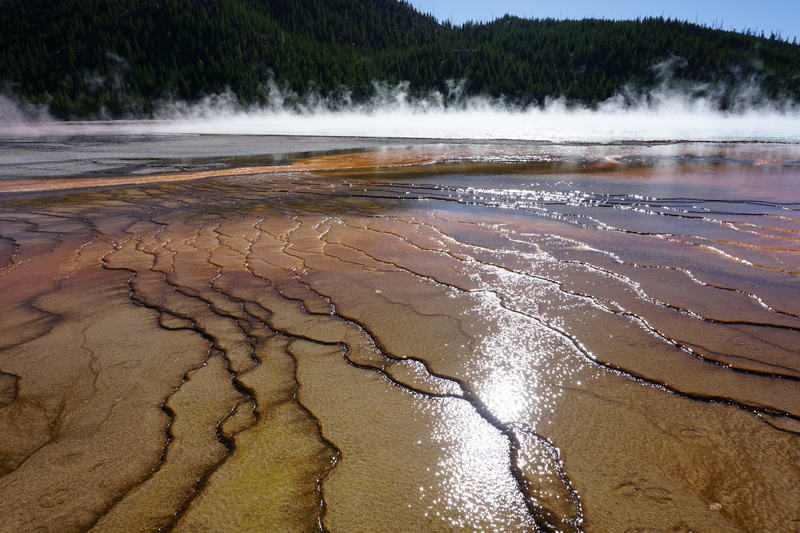 From the very small to the hugely powerful, the basin is dotted with steaming geysers. 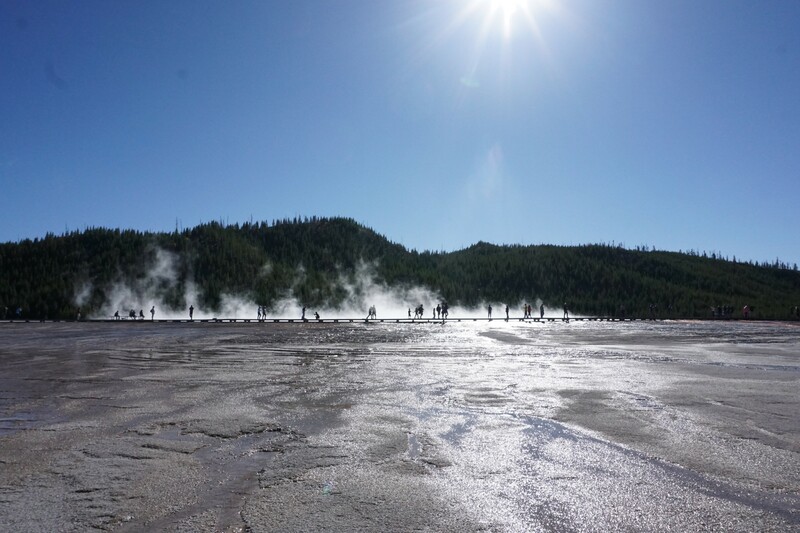 It’s pretty amazing to walk around this alien landscape with its steam fumaroles. Luckily for us, we arrived just as Castle Geyser was set to erupt which is pretty cool as it only goes off once every 10-12 hours. We actually ran halfway across the basin to see it and wow, were we pleased we did. 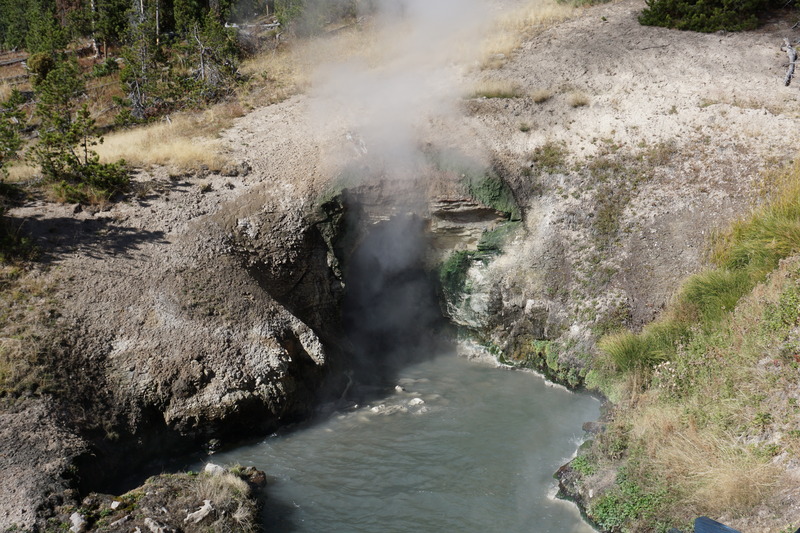 Hot water erupts from Castle Geyser for about 20 minutes which shoots up to 90 feet into the air before going into a noisy steam phase for another 30 -40 minutes. It also has the largest siliceous sinter formation in the world. Witnessing Castle Geyser erupt was such an amazing experience, the memory of which will stay with us forever. 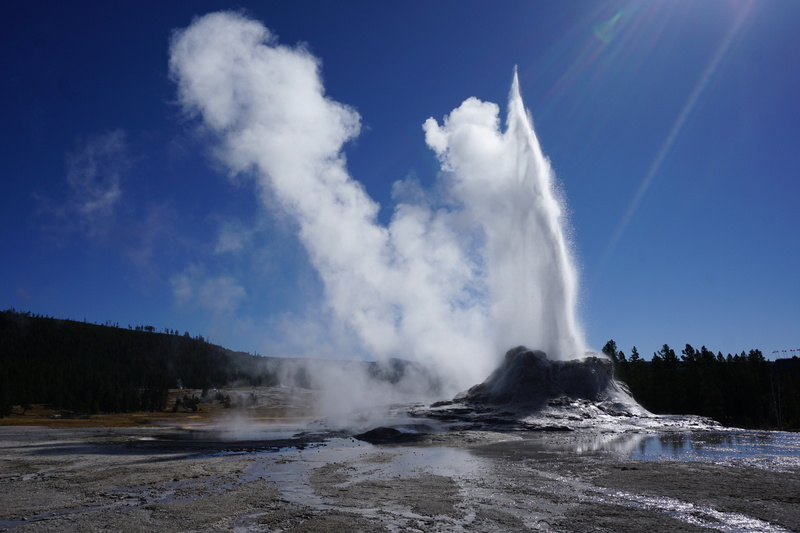 As its name suggests, Old Faithful Geyser can be relied on to erupt every 90 minutes, shooting boiling water to an average height of 145 feet into the air. A huge crowd gathers to watch the spectacle and we must say that tempers were running high to get the best spot. After a few false starts Old Faithful lived up to its name and put on its show. Although the water shooting high into the air is quite something, the eruption only last about 5 minutes. We hate to say it but we were more than a little underwhelmed. It’s worth watching as it’s Old Faithful, but the crowd is big so get there with plenty of time to spare to get a spot to be able to watch. To be honest we felt that Castle Geyser was much more impressive. 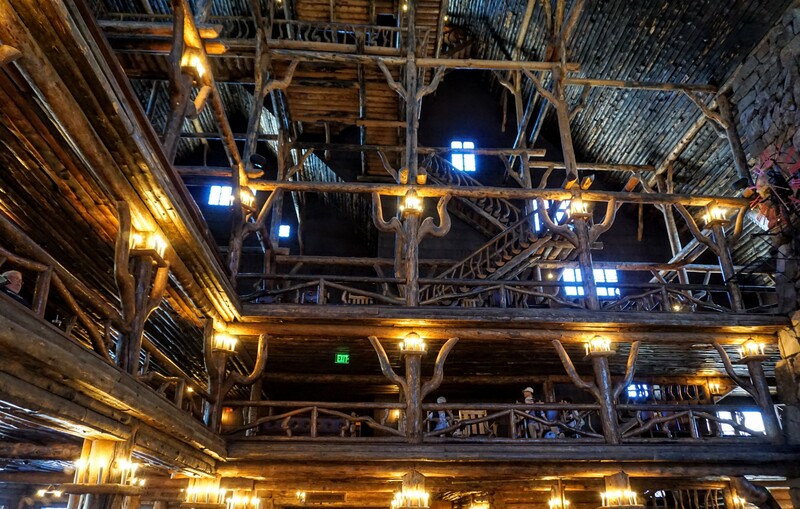 No visit to the Old Faithful area is complete without stepping inside the wonderful Old Faithful Inn. Built-in 1903 and opened in the Spring of 1904 the Inn boasted electric lights and steam heating. The main lobby is quite spectacular to walk into, with its huge stone fireplace that has a 16-foot square base and the timber framework makes the whole structure feel alive. You can sit in one of the many seating areas and soak up the atmosphere. Tucked up in the North of the park, Mammoth Hot Springs is made up of a series of hot springs. 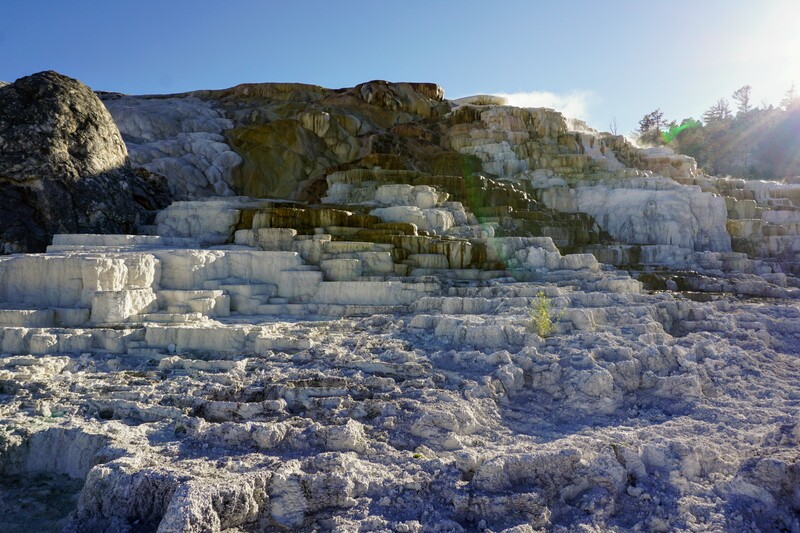 As boiling water cools it leaves calcium carbonate deposits and over thousands of years this has built up into the stunning Mammoth Terraces. A boardwalk leads up the white terraces in a series of staircases and platforms overlooking the steaming pools. 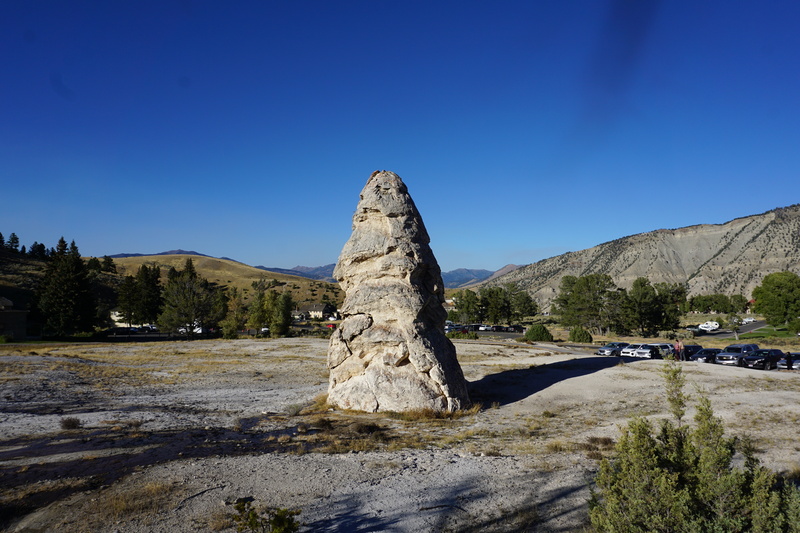 Standing at the base of the springs you’ll find Liberty Cap, a dormant spring cone protruding upward from the surrounding landscape. The small settlement of Mammoth Springs is situated just up the road and when we were there a huge herd of Elk were making themselves at home in the town’s square. Driving up into the Northeast corner of the park, along Highway 212, you’ll find yourself in the Lamar Valley. The rolling prairie landscape is ideal for wildlife viewing with huge herds of Bison roaming the area. There’s also Elk and bears frequently seen in the Lamar Valley. We drove through very late in the day ( we don’t recommend this at all ) as the wildlife was getting active and roaming across the road everywhere. Other than Bison we saw lots of Pronghorn which coincidently are the second fastest animal in the world and closely related to the giraffe. This is the area to come if you want to see wolves but you have to be here very early in the morning or last thing in the day with a good spotting scope. East of Old faithful and on the Grand Loop Road at Craigs Pass lies The Continental Divide. A sign marks the exact spot that Lake Isa straddles the Divide. 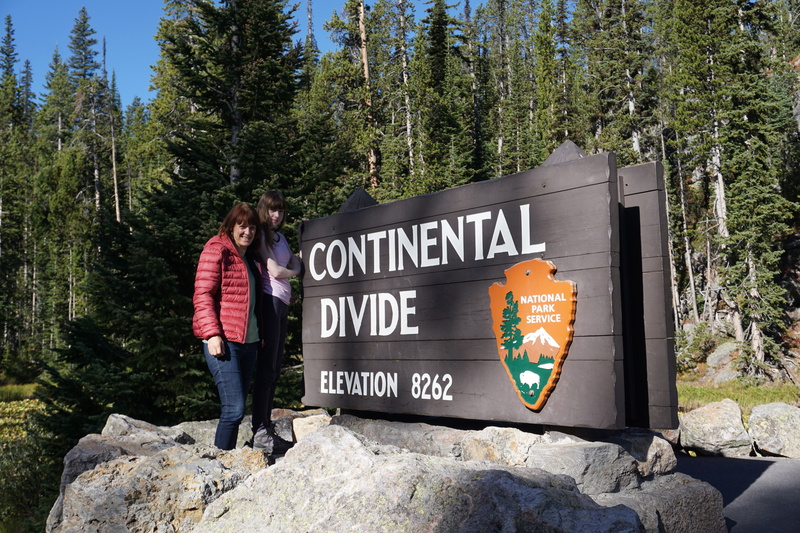 We had no idea what the Continental Divide is but an information board soon made it clear and it’s pretty cool. Basically, the Continental Divide is a line that stretches all the way through the Americas, with water to the West of the Divide draining into the Pacific Ocean and water to the East of the Divide draining into the Atlantic Ocean. We thought it was fascinating and well worth the stop. 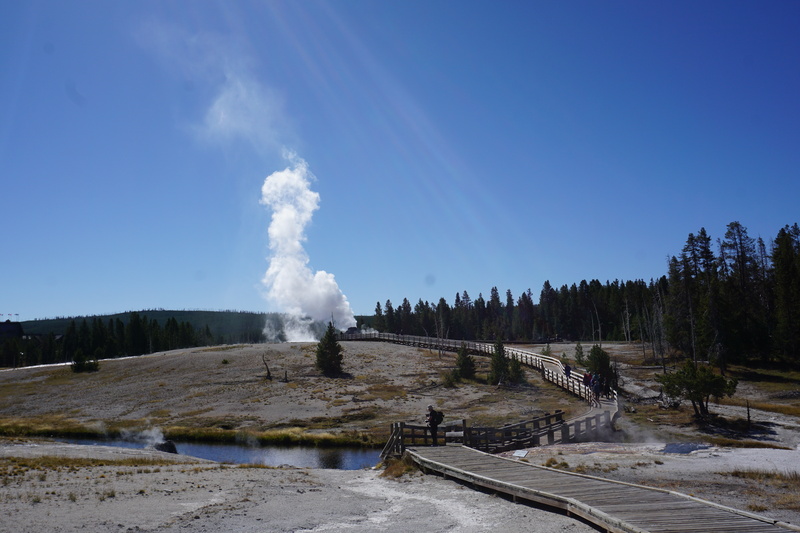 Located in the Hayden Valley, beside the beautiful Yellowstone River the Mud Volcano and Sulphur Cauldron are the areas top sights. A large parking area along the Grand Loop Road offers access to the Mud Volcano. We took the longer circular walk around the area where you can see lots of bubbling pools and vents. At the furthest point of the walk, there’s a lake where we saw a deer amongst the pine trees. We don’t know if it’s always like this but when we visited the Mud Volcano the smell of sulphur was actually overpowering and gave us all a headache. For a time afterwards we felt a bit ill but it cleared up OK once we left the area and got some fresh air. 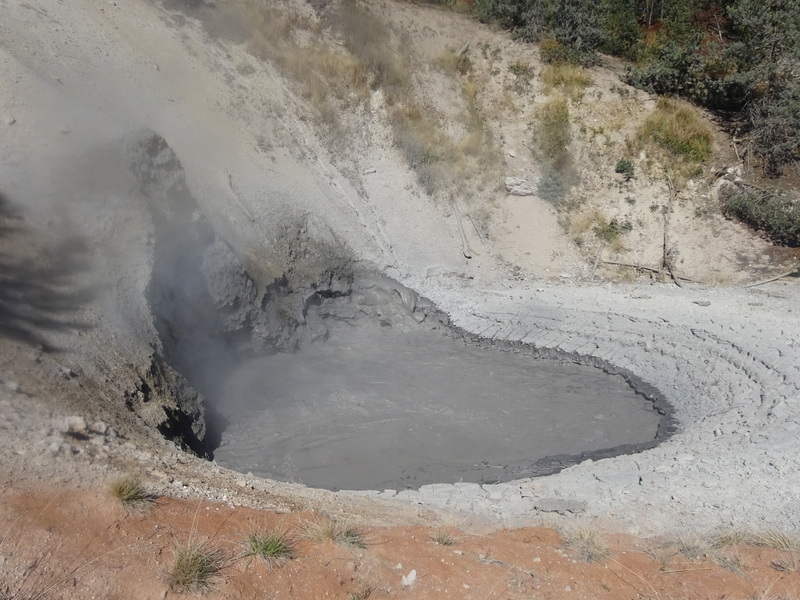 The main Mud Volcano is in a pool fairly near to the car park where the muddy water churns with gassy eruptions. A little way down the road you’ll find the Sulphur Cauldron venting its gaseous contents into the air. To get some fresh air we headed down to the bank of the Yellowstone River. There were a couple of other people and us and it was lovely and peaceful looking at the beautiful river flowing past. On the far bank, a cone was steaming away as we wander along the shoreline taking in the scenery. Situated at the Midway Geyser Basin and North of Old Faithful Park, The Grand Prismatic Spring is part of a series of springs. The landscape is hauntingly beautiful with steam rising from the whole area. 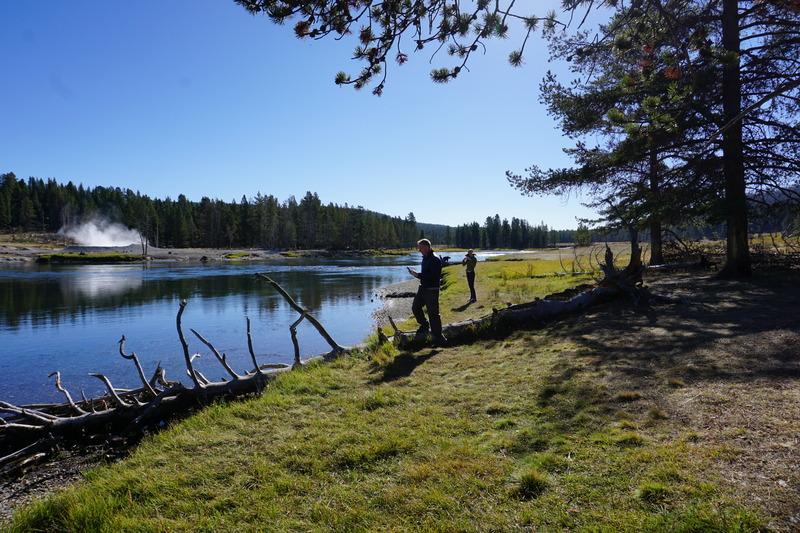 Wooden boardwalks take you out over the springs and alongside the Grand Prismatic Spring. The vivid colours of the spring are the result of the mineral-rich water creating microbial mats around the edges of the pool. The colours of the mats range from greens to reds depending on the amounts of chlorophyll and carotenoids and the temperature of the runoffs. We only saw the spring from ground level but later learnt that there is a viewpoint where you can see the colours of the pool from higher up..
Did you know that Yellowstone National Park has its own version of the Grand Canyon? The Yellowstone River has carved out a huge canyon as it winds its way through the park. Two massive waterfalls cascade down into the lower canyon floor as the river flows Eastwards. Leaving the main Grand Loop road you can drive the South Rim road out to Artist Point where an overlook gives spectacular views back toward the falls. It does get busy here with it being a main stop for the tour buses but the view more than makes up for the crowds. It’s also worth taking the North Rim Drive and getting out to see the falls from some of the viewpoints. The viewpoint at the top of the falls is particularly spectacular as you look over to see the water dropping over the edge and thundering down to the canyon floor below. 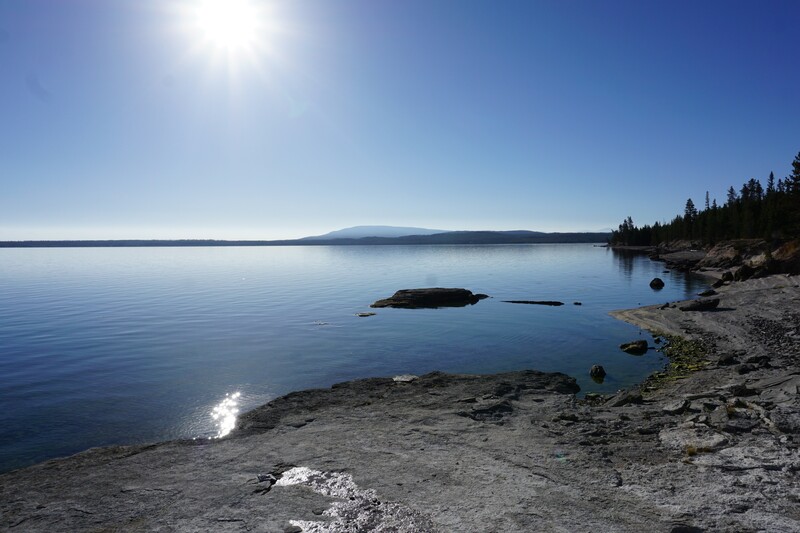 Yellowstone Lake is huge and an attraction in its own right but on the Western Shore you’ll find the West Thumb Geyser Basin. From the parking area boardwalks take you all around the barren shore that is dotted with volcanic activity. 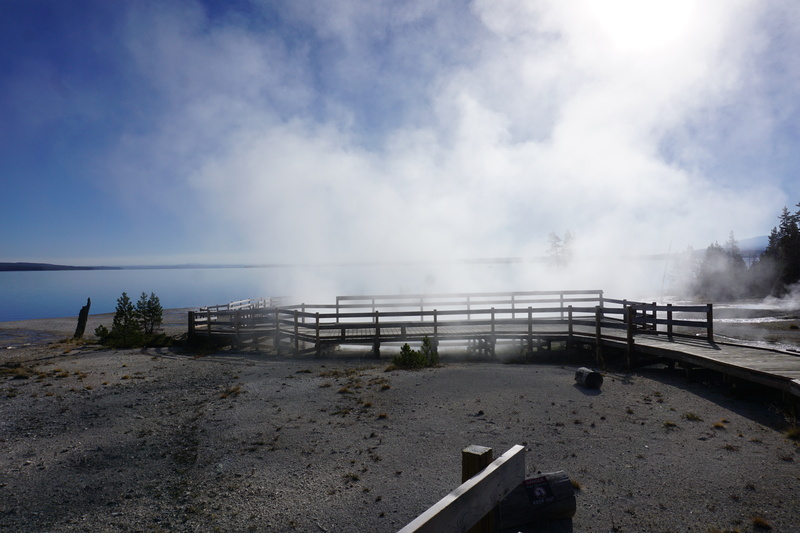 Steam vents, volcanic springs and geysers cover the area with the backdrop of the beautiful Yellowstone Lake. The whole area looks like something out of a disaster movie with trees stumps sticking out of the acidic earth and clouds of steam drifting across the landscape. Look at a map of Yellowstone National Park and you’ll see that the roads form a figure eight. There are then five roads that join this figure eight from the entrances of the park. The outside loop of the figure eight is known as the Grand Loop and will take you to most spots of interest in the park. The Grand Loop is 142 miles long and would take between 4-7 hours to drive without stopping. You’ll need to take your time to see everything and allowing for slow driving speeds due to wildlife on the roads. It’s a pretty difficult drive to complete in one day and is better broken up into smaller sections. The drive is epic and the scenery is amazing. Having your own transport gives you the freedom to visit the areas of the park that interest you the most. You can take your time and do what you want to do. There are coach tours of Yellowstone but from what we saw they just give you a whistle-stop tour of the main sites. From outside the park, you can join tours run by external companies that will bring you into the park from the surrounding towns. 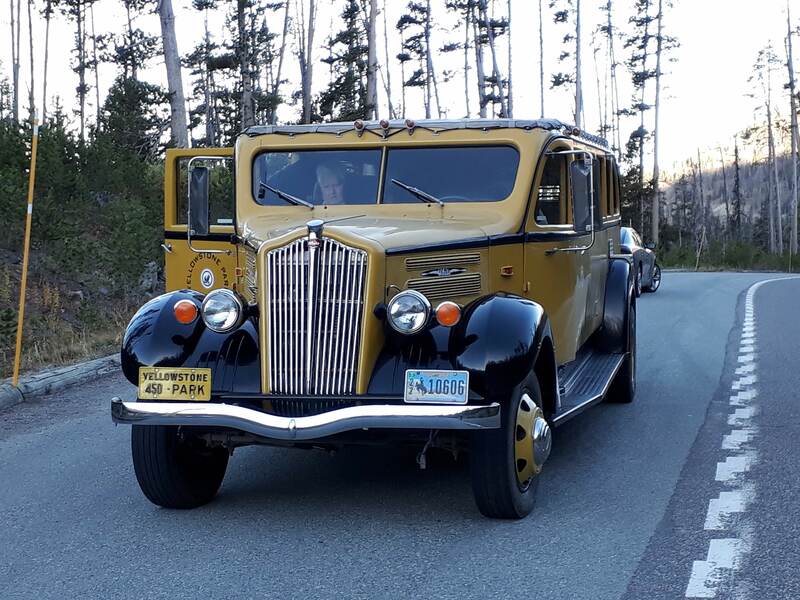 Within the park, you can join one of the very cool looking Historic Yellow Bus Tours that pick up passengers from the park’s lodges. During Winter there’s no vehicle access into the park but snowmobile and snowcoaches run tours into the park. 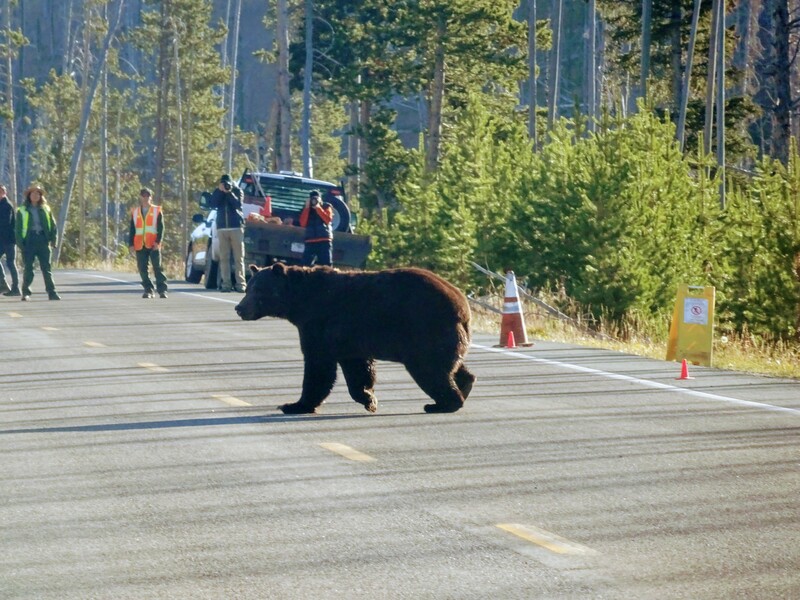 Remember that driving distances are long and it will take you longer than you think to drive anywhere as there’s often wildlife on the roads. This was one of the things about visiting Yellowstone that challenged us the most. 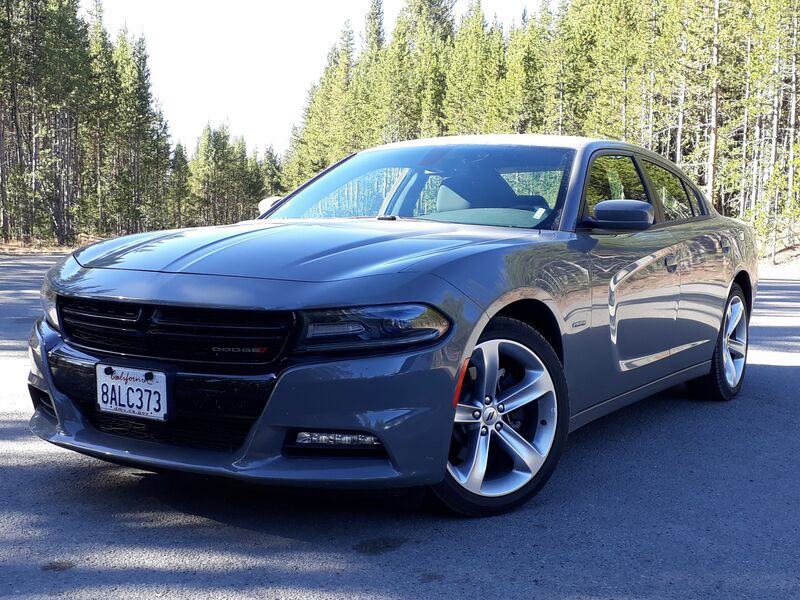 If you have limited time or want the ease of being right in the park to cut down on driving distances then staying inside the park might be an option for you. There are several lodges within the park all run by the National Park, but they are expensive and we wanted to visit on a budget. The lodges also get booked out, over a year in advance so that option was out for us as we wanted to stay flexible and only decided we were going there a couple of months beforehand. There are campgrounds within the park that give you a less expensive option but still allow you to be within the park. We didn’t have any camping gear so this option was also out for us ( although we could have purchased camping gear ). If you don’t want to camp then this is the next best option. In high season accommodation in the gateway towns also get booked out but we were hoping that visiting in early September may mean we could just turn up somewhere. You could choose any of the gateway or surrounding towns like Gardiner, Bozeman, West Yellowstone, Jackson or Cody. All the towns are quite a drive from the park but if you’re willing to put in the driving then it pays off. 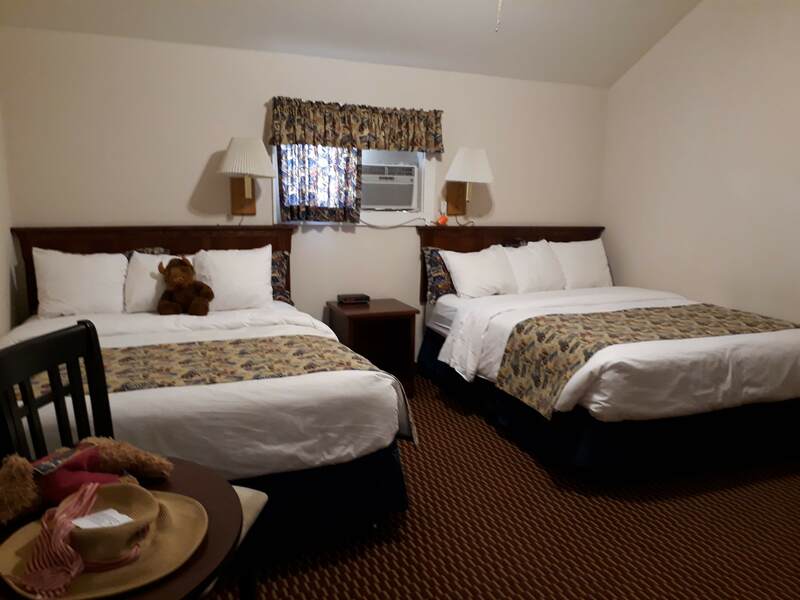 We ended up getting a really good deal at the Holiday Inn, Cody, Buffalo Bill Village. 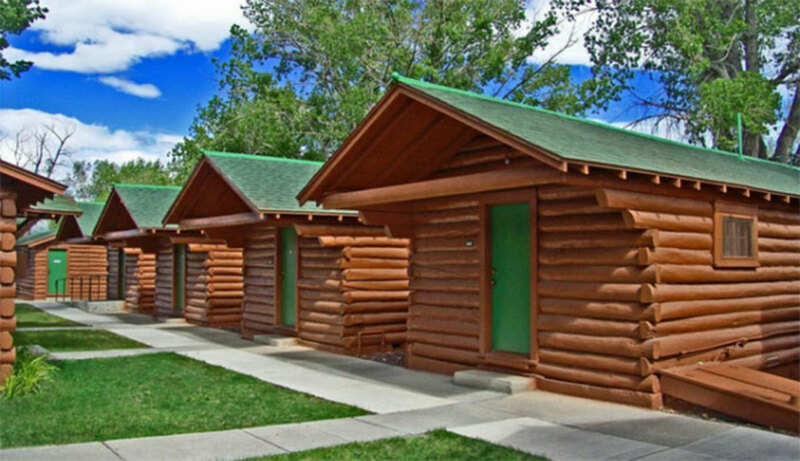 They have some really cute little cabins out the back of the main hotel that are lovely and actually less expensive than staying in the main hotel. You get the use of the hotel’s pool but we didn’t have time to take a dip. You have to book the cabins in the quaint little Buffalo Bill Village Shop, adjacent to the hotel’s main entrance. We stayed for three nights and loved the cosy cabin feel. 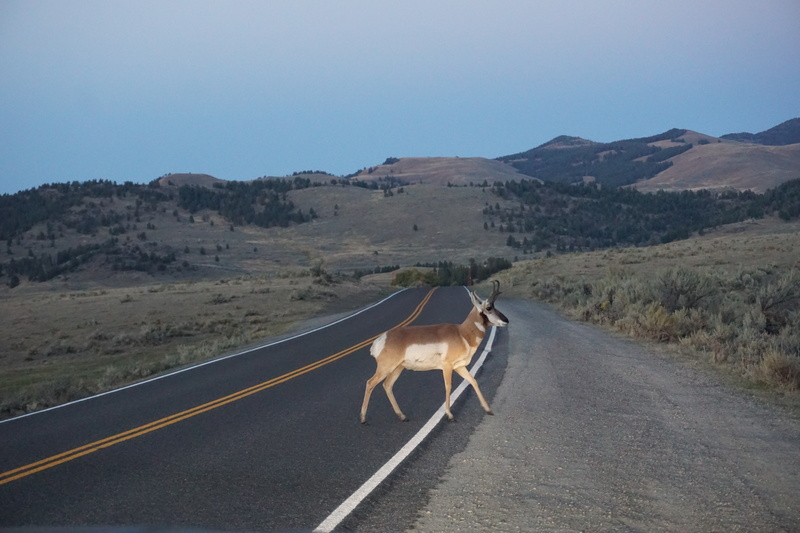 Cody is about 50 miles from Yellowstone’s East entrance and takes about an hour and a half to drive as we had to drive slowly before the sun came up because of wildlife. There’s no getting away from it, food is expensive inside the park. Taking a picnic into the park would be the best and cheapest option but we had such limited time we were leaving Cody before sunrise and returning after everything had shut for the night. So we did end up eating inside the park. We would fill up on fuel each of the three mornings we drove in from Cody and bought some snacks to munch on through the day. 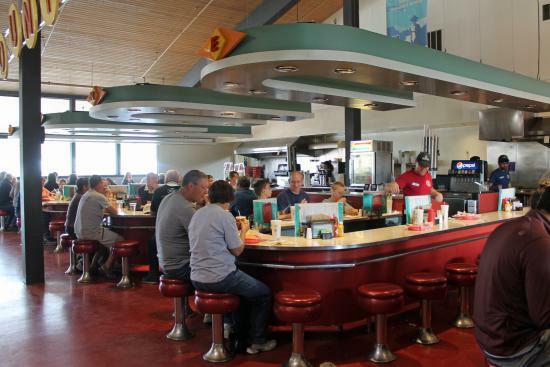 Inside the park, we ate at the Soda Fountain, Canyon Village General Store which is a diner style burger joint. It’s nothing special but it filled a hole to take us through the rest of the day. The other place we ate was the Old Faithful General Store who also have a grill type service. We did try their bowls of chilli which were delicious. There are tons of dining options in the park but as I said they are all pretty pricey. We were quite adamant about the time of year we wanted to visit Yellowstone. After lots of research, we decided that the first half of Septemberer and after Labor day was the time to go. It’s always going to be a gamble with the weather and crowds. Go too early and the park is overwhelmed with people and cars, go to late and the first snows can hit. I think we timed it to perfection arriving in the park on the 16th September. We had the most glorious weather that was really quite warm and with the most beautiful blue skies. There were still quite a few people around but nothing like the descriptions of Summer crowds I had read about. We didn’t have traffic jams or anything like that. Most people we saw were in the Old Faithful area. We spent three days in the pack with every day being beautiful weather but we heard that the day after we left it snowed. The other time we looked at was the spring but it seemed as though the bad weather could hang around and it may be muddy from the ice melt. 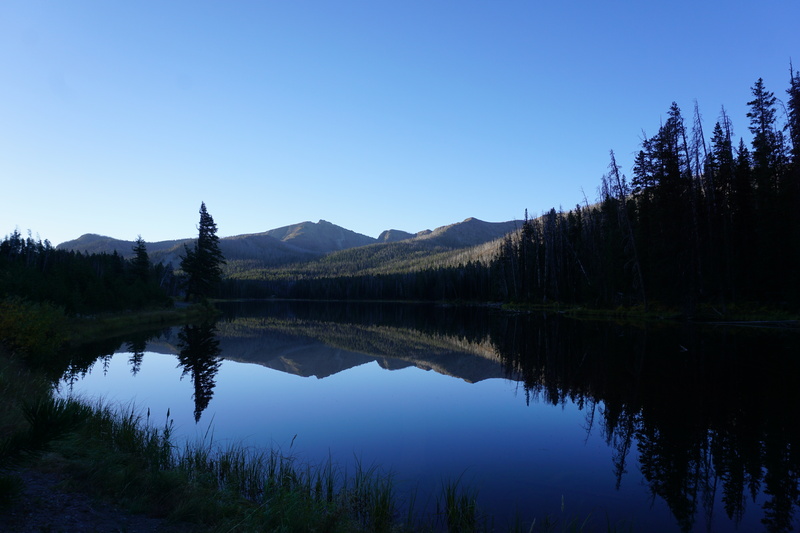 A visit to Yellowstone National Park is a gamble but we kept our eyes on the weather forecast and rearranged our road trip accordingly to get to the park at the best possible time. 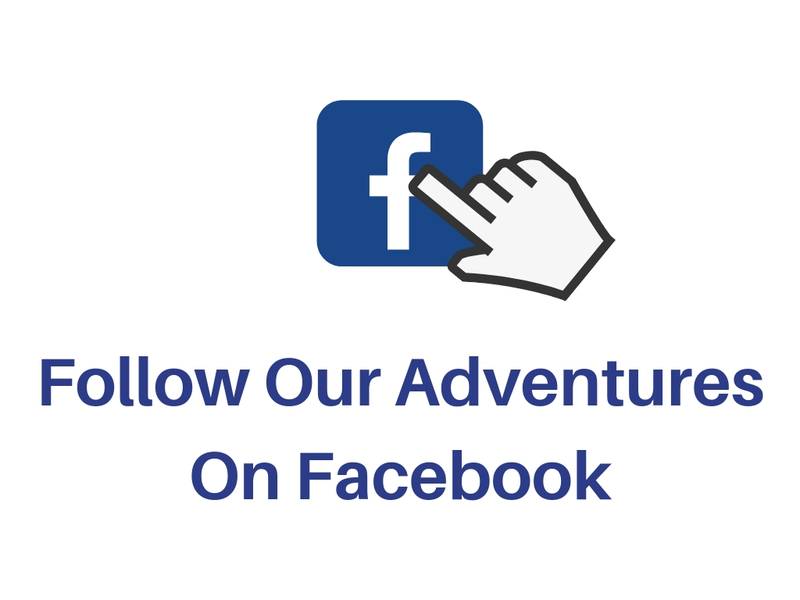 We would love to visit during Winter time but that would be a much more expensive trip as there are no vehicles allowed in the park during Winter so you need to book Snowmobile or snow coach tours. Our visit to Yellowstone National Park really was a dream come true. We’d waited so long for the right time to go there and it worked out perfectly. We saw lots of wildlife which included the bears we’d hoped to see. The volcanic activity including the geysers, springs and steam vest were otherworldly. We must admit it was very tiring as we did so much in three days and had to drive backwards and forwards between Cody and the park. Sometimes we went without food because of travelling but it was so worth it. Would we return to Yellowstone, in a heartbeat but then again I’m not sure that we could beat our first experience of the park. 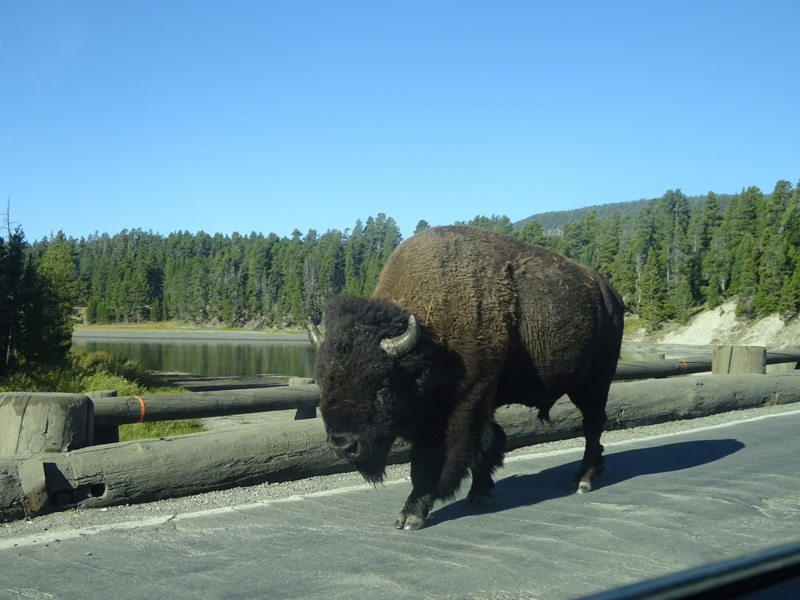 Have you visited Yellowstone National Park or would you like to visit? If you’ve been, what was your experience of it?